From the rugged Twelve Bens mountain range in the north to the golden beaches reaching out into the Atlantic Ocean, you'll know you're in Connemara by the light that constantly changes the mood and tone of the landscape. Connemara has long been regarded as the real emerald of Ireland. Many of our guests like to visit Connemara when they stay with us. The drive west leads through picturesque landscape and countryside that is famous the world over. Some popular points of interest are Connemara National Park, Kylemore Abbey and Clifden town. For more information on Connemara, see the http://www.connemara.ie web site. On the west coast, the Cliffs Of Moher are one of, if not the most spectacular coastal features of Ireland. From here, one can see the Aran Islands, Galway Bay, as well as The Twelve Pins and the Maum Turk Mountains to the north in Connemara and Loop Head to the South - the views from the top are never tiresome. Being almost vertical, their sheer drop into the heaving Atlantic ocean is a haven to the huge number of nesting seabirds that make it their home. These include the Atlantic Puffin, Razorbuill, Chough and Common Gull. The area is designated as a Refuge for Fauna since 1988 and as a Special Protection Area for Birds (SPA) under the EU Birds Directive in 1989. They have been the location for movies including Harry Potter & the Half Blood Prince, The Princess Bride, Into the West and Ryan’s Daughter, TV shows like Father Ted, and for music videos by bands like Westlife. Big wave surfing at ”Aill Na Searrach” or "Aillens" for short has really taken off over the last couple of years. Surfers travel by jetski from Doolin to the wave at the bottom of the Cliffs which can be over 35ft high! See http://www.cliffs-moher.com for more details. A visit to the Burren, one of the world's most stunningly unique natural heritage regions, is the beginning of a journey through time. Nestling just off Galway Bay, on the western Atlantic coast of Ireland, are over 259 square kilometres of dramatic limestone karst landscape we know today as the Burren, a name that comes from the Gaelic word Boireann, meaning "place of stone". The omnipresent stone-built monuments which abound in the Burren whisper of a civilization whose architecture was ancient by the time the Egyptian pyramids at Gisa were even conceived. One quarter of all the known megalithic wedge tombs in Ireland are situated in this region. With its innate sense of spiritual peace, extraordinary array of flora and wildlife, and megalithic tombs and monuments, the Burren creates a tapestry of colour and a seductively magical aura which few people leave without wanting to experience again. Popular destinations for visitors to the area are the Burren National Park and The Burren Centre, with the latter providing eco walks and tours of the unique landscape which have been cerrtified by EcoTourism Ireland. Inishmore (or Inis Mór in the Irish language) is the largest of the three Aran islands, with its principal village being Kilronan. An excellent Visitor's Centre, Ionad Arainn, provides a solid introduction to the history and culture of the island. Sites to see include the interesting remains of Arkin's Castle, a Cromwellian fort that maintained a garrison during the 17th and 18th centuries. Saint Ciaran's Monastery, east of the village, where can be seen also several early cross-slabs, pillars and a holy well dedicated to the early saint. Also in this locality is the very early Saint Soorney's Church. To the west of Kilronan is the church of Saint Enda, the saint most closely identified with the spread of Christianity on Aran. 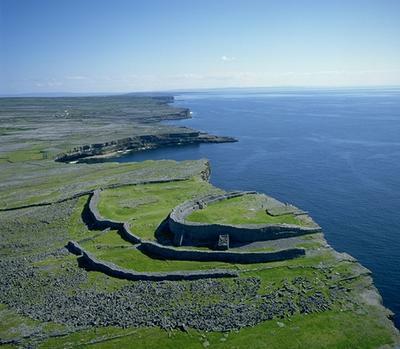 Undoubtedly the most famous and impressive site on Inishmore is the great stone fortress of Dun Aonghasa -- the largest of the prehistoric stone forts of the Aran Islands. It is perched spectacularly on the edge of a sheet 100m (300 ft) cliff that falls away into the Atlantic Ocean. For more information, please visit The Aran Islands website. Also known as the City of the Tribes, Galway is often regarded as the most 'Irish' of Irish cities. The brightly painted pubs, cobbled streets and fish and chip shops certainly live up to the quaint, picture-postcard image of Ireland, and it's the perfect place to buy an Aran sweater or a Claddagh ring, but the long-standing tradition for fine food, frothy Guinness and lively music is far more than just a tourist gimmick. As the cultural heart of Ireland, Galway is the best place to experience traditional Irish music, culture and cuisine in its modern interpretation. The city gets its creative atmosphere from its residents; artistic and bohemian, a quarter of the city's population is made up of students. 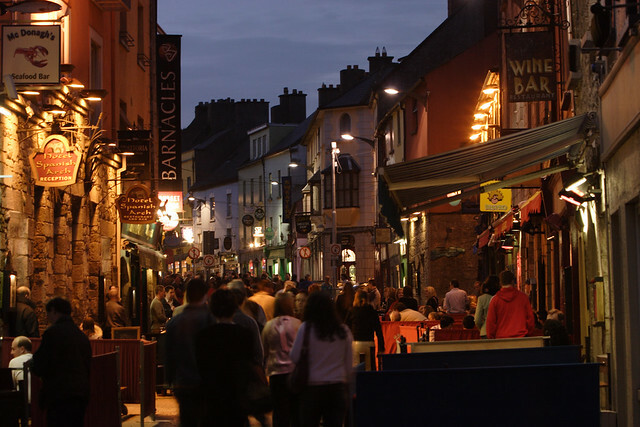 A constant stream of festivals and events includes the Galway Races, the Galway Arts Festival (including the annual Macnas Parade) and the famous Galway Oyster Festival. The Galway City Museum is also popular with tourists. For more information, visit Discover Ireland's Galway Homepage or Lonley Planet's Galway Guide. Loch Corrib is a vast lake of about 44,000 acres and is the second largest body of inland frest water in Ireland. It stretches some thirty five miles from Galway City to Maam Bridge and varies in width from about eight miles to about one quater of a mile. Here you will find one of the best game fisheries in the world and is a wonderful place to experience what Ireland has to offer both in terms of the game angling and the hospitality of the local people. Please see this Fishing on Lough Corrib link for more details. From Woodquay in Galway City, you can enjoy the relaxed atmosphere of a cruise on board the luxurious Corrib Princess. The journey takes passengers along the majestic River Corrib and onto the lake providing visitors with unsurpassed views of the historic monuments and natural amenities that make this the most spectacular waterway in Ireland. The cruise takes you past castles and various sites of both historical interest and natural beauty. There is an abundance of wild life and the Corrib has a peace and tranquillity all of its own. From Cong in Co. Mayo, Corrib Cruises run cruises on board "The Lady Ardilaun" from Ashford Castle to Inchagoil island and Oughterard. This cruise takes you on a beautiful voyage down Lough Corrib with guided commentary of islands, lake and shoreline. There are also other cruises available.